The purpose of the Drinking Water Regulation is to protect human health from the detrimental effects of contaminated drinking water. This is achieved by warranting continuous drinkability and purity for human consumption at the point of use. Drinking water is a perishable food item without a use-by date printed on it. In addition to the high requirements made on all drinking water installations, the medical and healthcare sectors impose stringent standards of hygiene and operability for all mixers faucets and fittings. The special importance of ensuring the highest possible quality of drinking water in the healthcare sector is also reflected in the prominent position of the German law on the prevention of infectious diseases which essentially determines the detailed requirements on the handling and use of drinking water. 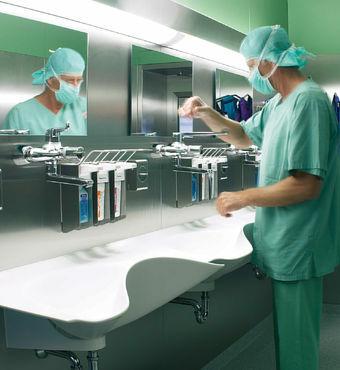 The implementation of the hygiene standards has been entrusted to the Robert Koch-Institut whose official recommendations (the so-called “Krankenhausrichtlinien” or “hospital guidelines”) are also taken into account in the technical regulations. Given employees’ exposure to water, the relevant Health and Safety standards play an important role in the legislative process The German „Regulation on the Amendment of the Drinking Water Regulation of May 21, 2001“ was published on May 28, 2001 as an implementation of the European Drinking Water Directive in German law. The Drinking Water Regulation (TrinkwV 2001) entered into force on January 1, 2003. Operator‘s notification duty towards the German Department of Public Health in case of exceeding maximum limits on chemical and microbiological contamination for instance upon the occurrence of legionellae or pseudomonadaceae. The responsibility for maintaining the quality of the drinking water in an installation within a building is now held by the operator. Section 4 of the German Drinking Water Regulation works on the assumption that any drinking water that is going to be distributed complies with the microbiological and chemical parameters and indicators specified in the Regulation. It also assumes that the procurement, treatment and distribution of water comply with a range of generally established technical criteria. The installation within a house or institution is considered to constitute the final stage of the water distribution. The standards and info sheets listed here are considered to be established technical criteria for the planning, setup and operation of drinking water supply systems. To update its technical criteria and to implement the relevant European standards, the Water Standards Committee for German DIN Standards has decided to revise and consolidate all standards in connection with drinking water supply systems. Moreover, a range of further important changes are likely to follow. Health hazards in drinking water supply systems may be due to a variety of causes. Physical changes include, for instance, increased temperatures in the cold water range. Chemical changes are indicated by increased concentrations of metal ions, and stagnation is a sign of microbiological changes. Some important issues in this context are proper professional planning in a way that suits a given special application, selection of the correct products and materials, impeccable craftsmanship in carrying out installations and use of a supply system for its intended purpose. Essential roles are played by servicing and maintenance, on the one hand, and by operation and use, on the other. The latter can ultimately only be ensured by the operator.